WELCOME to Kaalratri, a blog about feminism and women’s experiences. Kaalratri is about all our collective wisdom, regrets, thoughts and hopes on current issues and topics affecting gendered lives across the globe. Our endeavour is to rethink SILENCES, SOLIDARITY, DIFFERENCE and DIVERSITY. We have wanted to do this for a while; to find a space away from our professional lives and work where we could share stories and commentaries with our global sisters. This is a non-judgemental, non-academic space to vent, share, argue, empathise and extend solidarity. We believe in the power of storytelling in all healing; we believe that every experience is unique; every emotion is special and that, there has never been a greater need to TALK and LISTEN than now! We are interested in locating the ‘personal as the political’ and in reclaiming all spaces that have been hijacked by patriarchal and misogynistic agendas. We draw inspiration from KAALRATRI, one of the nine forms of the Indian female deity, Durga or Shakti. Kaalratri is considered the most violent form of Shakti as she evokes fear. She is the destroyer of all demonic forces and negative energies. The name itself means “the death of night” and Kaalratri is the one who destroys ignorance and removes darkness. 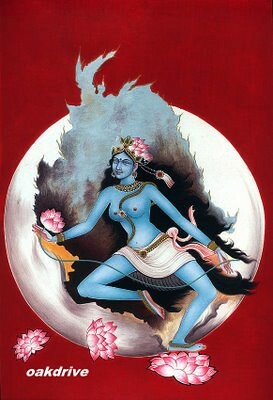 This form of the Goddess primarily depicts that life also has a dark side which is overcome by calmness and courage. We want this blog to be a collective and creative enterprise with stories and commentaries from a wide range of authors from different ethnicities, religion, location and professional backgrounds who have a story to tell, a thought to share in a public forum. We are interested in exploring common themes in our shared experiences. We hope that this blog can provide a forum for dialogue, activism, and empathy. Contributions from women and men are welcome. We promise anonymity to those who do not wish their names to be revealed when they post. PS: As editors and managers of this blog we reserve the right to reject posts and comments that are abusive, offensive, intolerant or any other form of hate-speech.